On the few occasions I’ve given someone who has never visited Grahamstown a lift to that city, I suspect I end the journey being rather a bore. Particularly if my traveling companion is younger than I, which has always been the case. As the road from Colchester starts winding into the rough foothills of what the tourism board in a flash of inspiration named Frontier Country, the history contained in that rough landscape demands attention and I simply cannot help remarking, at length I suspect, on how the present so viscerally continues to mirror the past. But the increasingly glassy quality in my passenger’s eyes cannot detract from the fact that if you know anything about what happened in the land between Port Elizabeth (Algoa Bay) and the Kei River in the first half of the 1800s, the intervening years have done little to change the structural relationships and geographic divides between Europeans and Xhosas living there. My love for this particular scarred corner of the world, and my own family history, means Death of a Colonialist, dealing as it does so directly with the struggle and blood of this landscape, is a treat to watch. While history is a central theme, the play, as the best ones all do, works on more than one level. On the one hand there is the particular microcosm of South African history that reflects, and offers explanation for, much of what concerns us in present day society and politics. On the other hand there is the more universal internal struggle the Smith family face due to their own history and the overwhelming presence of the head of the household, one Harold Smith who, though recognisably an Eastern Cape character, has his counterparts the world over. I could imagine a Scottish version, or a Serbian. Played by Jamie Bartlett, Harold is a history teacher of some 35-years standing at a Grahamstown boys’ school. He’s even more passionate about the history of the Eastern Cape than I, which gets him into trouble with the board. He’s also a lot more entertaining. A charismatic, occasionally bombastic, larger-than-life character who has an almost fanatical sense of place. I’ve met quite a few men like him in the Albany district, it’s hard not to. Some are quieter, some are more violent. But it seems there’s something about that wild, arid, blood-soaked landscape with its semi-tropical air that engenders – or attracts – a rough-and-ready personality. I’m fortunate to consider some of them my friends and am familiar with their strengths and foibles. Jamie Bartlett manages to capture the type perfectly with no small thanks I’m sure to writer Greg Latter who must have spent a good few years in the district (or have done his homework) to catch something like that that English settler alpha male homecoming ‘Yes Yes!’ greeting so well. He’s eminently loveable, old Harold. Just so long as you don’t have to live with him, for even living with him for 90 minutes becomes a bit tiresome. The trouble is that there are three other actors in the cast yet they appear to be on stage merely to reflect the glory that is Bartlett, to the extent that at times the play becomes little more than the Jamie Bartlett show. Granted they are all cast as members of his family, a family that is falling apart partly thanks to the self-involved character that Bartlett plays. But given that he already has the leading role, he really needn’t act as if he is competing for the limelight. He’s a strong actor with commanding presence. He’s just not very subtle. One could blame director Craig Freimond for not reining him in but it could be that it is an exasperated director’s hard work that ensure Bartlett’s determined efforts to at all times be the centre of attention do not ruin the play. 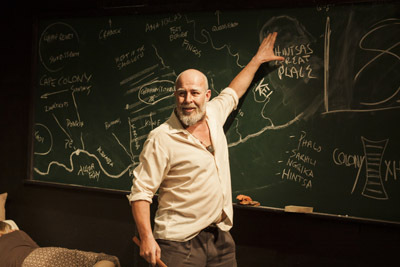 It would be a relief if Bartlett could occasionally just back off and allow the moments of pathos contained in certain scenes to draw us in instead of always playing to the crowd and forcing us to have to try look past his twitches, ticks and furrowed brow which threaten to smother the finer layers of the play. For on the surface this is a work dealing with history and reconciliation and a passionate love of place and identity. But what lies beneath, what provides it with further depth, is loss, and more particularly, the way loss is not acknowledged in a patriarchal (also read: colonial) society. The scene in which Harold, years after the incident, finally asks his daughter Susan – ably played by Ashleigh Harvey – what occurred when she was hijacked, is a crucial moment in the play, maimed by Bartlett’s insistent theatrics even as he is pretending to be experiencing an epiphany of self-realisation. He does the same thing when he learns of his wife Margaret’s cancer, despite actress Shirley Johnston’s exquisite acting. And when Nicholas Pauling, who plays his son Jonathan, tells him news of his impending divorce, Bartlett keels over as if it’s him who has been cheated on. I don’t think the possible argument that Bartlett is simply portraying Harold’s overwhelmingly demanding personality which is what has got the family into its state of denial and retreat. There has to be the means to allow the other cast members to be more than cardboard cut outs. It is testament to Johnston’s ability that she manages to draw our attention and flesh out her character Margaret into one as recognisable as that of Harold even while Bartlett scratches his bum. If only she had a little more space to break our hearts instead of always having to give way to Bartlett’s clowning. Death of a Colonialist is showing at the Baxter Golden Arrow Studio until February 22. I was wondering when someone was going to accuse Jamie of hogging the play. Certain plays are written with a strong central character and the success of the play depends on casting an actor who has the power and personality to pull it off. These powerful personalities with star quality are few and far between. I would be very surprised if any of the actors supporting Jamie Bartlett resented him in any way as they know that without him they probably would not have a hit play. I have often been in the same situation playing opposite actors like Joe Stewardson and Michael Atkinson and any good actor recognizes when he/she is working with gold and is grateful for it.